Add the coconut milk, coconut sugar, vanilla and tapioca flour in the blender and blitz into a smooth consistency. Pour the contents into a bowl and stir in the shredded coconut. Set up the ice cream maker according the manufacturers instructions – including adding the freezer bowl and churn accordingly. 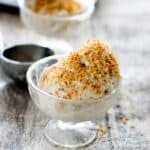 Serve immediately and top with toasted coconut or alternatively pour the ice cream into an air tight container (lined with parchment paper).